Femmy Cycle: 10 facts about this popular menstrual cup. The Femmy Cycle menstrual cup is one of the most popular menstrual cup brands in the world. If you have a low cervix, you don’t have a lot of options, and Femmycycle makes one of the best ones. Keep on reading for our 10 quick facts to know about this menstrual cup. Or, check out the full review here: Femmycycle Full Review. Most menstrual cups have a stem on the end which you can use to assist with removal. You should actually squeeze in the base of the cup in order to break the suction seal before removing it. Only grab the stem, and pull down gently on it if you can’t reach the base of the cup. However, pulling on a slippery stem isn’t often that easy! 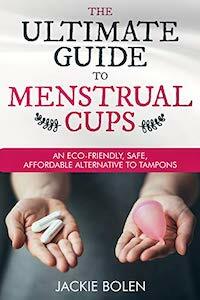 Some menstrual cups like the Super Jennie or SckoonCup have small balls on the stem that makes this process easier. However, some are flat, and very slick when wet. The Femmy Cycle has a ring on the end which we LOVE! Very few menstrual cups have this except for the Lily Cup One, Merula Cup, and the Meluna. This makes these cups shorter and perfect for people who have a low cervix. It also makes them easier to remove, especially for beginners. Most menstrual cups are made from silicone (except the Meluna Cup made from Thermoplastic Elastomer and the Keeper Cup made from latex). The best menstrual cup brands are made from top-quality, medical grade silicone. The very cheap menstrual cups are made from sub-par materials that are not medical grade. What about the Femmy Cycle? The good news is that it’s made from medical grade silicone that you should feel safe about putting into your body! At face value, the Femmycycle is a bit expensive. However, when compared to tampons over the medium to long-term, it’s actually very reasonably priced. You’ll come out even in around 6 months. After that? You have YEARS of savings down the road. You’re probably used to changing out your tampon every 8 hours because of the risk of Toxic Shock Syndrome. There’s some good news about the Femmy Cycle. It can be worn for up to 12 hours at a time. Change it before you go to bed, sleep for 8 hours, have a leisurely breakfast, and then worry about your period. Sounds nice, right? It is. In terms of design, they are all similar. However, the low cervix one is shorter, while the petite is just smaller overall. If you’re looking to go zero waste for your period, then you’l LOVE the Femmy Cycle. It can potentially replaces hundreds of tampons. Over a lifetime, a handful of menstrual cups can replace 11,000+ tampons. It really does make a big difference for our environment. A common mistake that people make when they first use the Femmy Cycle is that they put it too high in the vaginal canal. This can cause leaking, and it’s also much more difficult to remove. The Femmycycle is designe to sit low in the vaginal canal, just so that the ring isn’t sticking out of you. Hundreds of people get Toxic Shock Syndrome from tampons each year. To date, there is exactly one reported case of TSS from a menstrual cup (the Diva Cup). Lower your risk of TSS by making the switch today. Here at Reusable Menstrual Cups, we LOVE cups that are made in North America, or Europe. They have a reputation for being made from the highest quality materials, as well as having strict manufacturing standards. The Femmycycle is proudly made in the USA. Fact #10: You’ll Probably Love It! Most people who try the Femmy Cycle really like it. We’re confident that you will too. The key is to not give up too soon. It takes most people 3-4 cycles to really get the hang of it. Put on a pad and keep on trying. You’ll get it. FemmyCycle Facts: Have your Say! What are some facts about the Femmycycle that we didn’t mention? Leave a comment below and share your thoughts with us.